Many people forget that Ferdinand Porsche used to work for Adolf Hitler, who at the time was the head man behind Daimler-Benz, Auto Union and any other technically advanced manufacturing company in Nazi-Germany. However the Daimler-Benz 170H clearly shows how Ferdinand used influences from one company and implemented them to another as well as how influential the Daimler Benz 170H was in terms of design and engineering for 2 of the most famous automotive designs in history; the VW Type1 and the Porsche 911. To understand the 170H though, you must first learn a bit of German automotive history. The predecessors to the 170H were developed in the early 1920’s, a Designer & manufacturer known as Rumpler worked closely with Daimler-Benz back then & in 1929 a race car with swing axles and a rear engine could be seen racing around Europe, but even while using some racing technology from the Rumpler designed racer, in 1933 Daimler-Benz tried miserably at a slightly over simplified peoples car. The 1933 130H was too small, handled poorly, was severely underpowered and looked absolutely horrid. Daimler-Benz scrapped the 130H after only 2 years of production and started to concentrate on 5 central-engine roadster which (purposely?) took up most of their time for the next few months during which Hitler told Ferdinand Porsche to hurry up with his prototype of the peoples car. 2 years later, with mounting frustration, Ferdinand Porsche’s failed attempts at making a prototype for the peoples car, Hitler returned to Daimler-Benz and ordered them to expedite the KDF prototype cars into production, the 170H being one of them. 170Hs came with high grade leather, radios and an overdrive on the export models and cheaper to manufacturer coil springs replaced the smoother and more reliable but longer to assemble torsion bars of the 130H. Sadly even with the launch of the somewhat desirable 170H Cabriolet limousine (open-top) the 170H never did as well as expected and Ferdinand Porsche had finally come up with suitable working prototype cars (which used alot of technology from both the 130H and 170H) and Hitler finally ordered them into production as Damiler-Benz was starting to move more upmarket. As you have read above, technically the 170H gave life to the VW Type1, or should I say the VW Beetle is a redesigned 130 & simplified 170H. Daimler-Benz wanted a cheap car to sell to the masses to help Nazi funding & to mobilize Germans. Sadly (for DB) when the 170H was launched, many MB loyalists turned their nose up to it, but with a different badge attached to it and Hitlers “Volkswagen” was born instead. Ferdinand Porsche later went on to once again improve on the technology he had seen & used in the rumple race car, the 130H the 170H and the VW type1 and implemented the finer and more technically advanced items in his new car and company; Porsche, but before he departed the Daimler-Benz Factory he left a flat-4, air-cooled engine of his Humble VW type1 on the roof of the factory, where it still runs, turning the huge 3-pointed star which is a symbol of reliability and quality till this day. 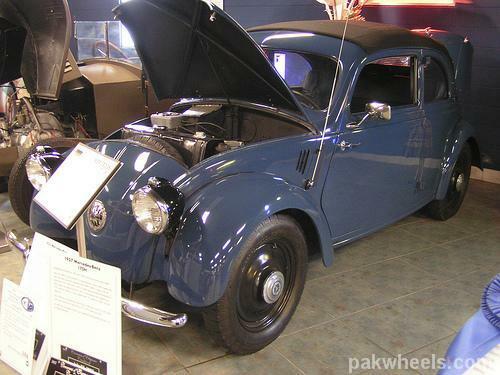 Visit the original topic of this Article: Mercedes 170H – VW & Porsche owe it alot. In ‘Blast from PW’s past’, we put forward the extraordinary topics that you forgot or missed on the forums. Water, water everywhere! - Part 2 of How to keep your car always new? Steyr-Daimler-Puch AG, the interest group that fired him in 1928. WOW-dude is correct, I ran this down. Can’t find much credibility in the 170H story. before ties are severed with Diamler Stuttgart. tenure at independent Austrian Daimler Engines AG is 11 years. tenure at Daimler Benz AG is just 3 years. tenure at Steyr Werke AG is just 1 year. starts his own company in 1931 and begins working for Hitler in 1934.
for the Third Reich 11 years until 1945 and dies at age 76 in 1951.
at Diamler-Benz (Mercedes) was minimal. subsequent models, was the Type 11 of 1923. It was the first commercially successful application of the central tube frame. This design is over ten years ahead of Porsches 1937 VW (Beetle) KDF-Wagen. dared challenge his decision or judgment, he became very angry and went into a rage, preventing any discussion. The final draft KDF version is very close to a combined but, extremely cheapened DB 1931-120H, 1934-130H and 1936-170H. Again the 170H design was not just designed but, built ahead of Ferdinand Porsches KDF-Beetle. built prior to Porsches KDF/Kubel. the VW KDF-Wagen. The Porsche family continues to have a massive body of acolytes closely guarding their footprints on history. correct. It makes us all look bad for referencing or quoting such off base material.